Text me exclusive wine deals! Some special offers are ONLY shared with SMS subscribers. Distinguished by being one of the very few French estates handed down through the generations since 1804 (seven, to be exact) through the women of this historic family. Today, Vieux Château Bayard is run by Marie Laure Ressiot who is joined by husband Matthieu. Both are wine experts, and both are as charming as the wine they so livingly produce. The couple only produced a Reserve Personnelle in excellent vintages, and they source the top estate plots for this cuvee. The wine is 80% Merlot, with 15% Cabernet Sauvignon and 5% Cabernet Franc, fermented traditionally and matured in barrique. 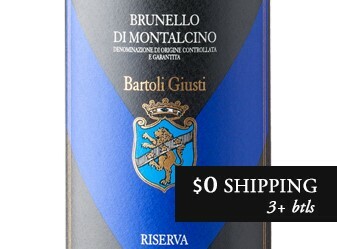 At release, this delicious bargain required time in the cellar. Now at six years post harvest date, the wine is open and inviting—showing generous black fruit flavors and a rich, full-bodied impression with a touch of vanilla on the long, classically Right Bank finish. Drink with food now and over the next five years. · While only recently a favorite of the wine press, the Montagne St Emilion appellation won its AOC status in 1936 and has quietly produced red wines of great quality and longevity ever since. · Unlike most of Bordeaux’s AOCs, Montagne St Emilion allows only red wine under the designation. Merlot is king here, as in all of the Right Bank AOCs, and the wines show this varietal’s classic cocoa and plum characters. 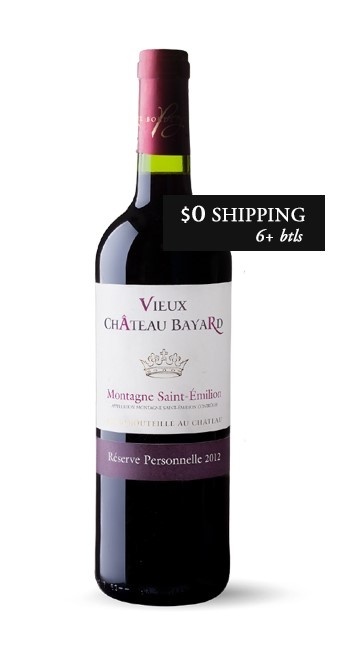 · Though five grape varieties are permitted in this appellation, Château Vieux Château Bayard grows only three: Merlot, Cabernet Sauvignon and Cabernet Franc. · The 2012 vintage was super successful for the Right Bank, with Merlot in particular, reaching ideal extraction and ripeness levels. Its deep purple colour let us figure out a beautiful concentration. Just in the first perfume we can feel the silky mix of black fruit and spicy elements. Generous boarding, the structure reveals the presence of tannings already melted. The final is extended along some compote and vanilla touches. The vineyard Vieux Bayard-Arvouet is located in Bordeaux, in the middle of the most prestigious terroirs of Libourne and the northeast extension of St. Emilion on the right bank of the Garonne and the Dordogne. The first one is located in the heart of the appellation Montagne Saint-Emilion Vieux Château Bayard (12 hectares). These buildings were built during the fourteenth century and its name is inspired by the famous Bayard knight who fought with François 1er at Marignan battle in 1515. The Chevalier Bayard stayed in the property which happens to be the oldest in the village and it attributed its name. The second in the area of Appellation Castillon Côtes de Bordeaux Château Sanctuary in Puisseguin. The Castle Sanctuary (5.5 hectares) is received on the ancient lands of the famous Castle Monbadon, one of the last testimonies of medieval military architecture remaining in Gironde. These lands were conquered during the French Revolution. The name of our field is inspired by the statue of the Virgin Mary located in the vineyards. This statue was venerated by pilgrims going to Saint Jacques de Compostela. Knights of Jerusalem marched through the vineyards. The Xth to the XVth century. The third entity is formed by the Château d’Arvouet (4 hectares) also located on the Mountain locality of Arvouet, remote Bayard 500 meters. She is the recent acquisition of Bregeon family from Vendée with which we have just set up a genuine partnership in a desire to respect the terroir and the local know-how. The 2012 vintage was the first vintage of this new “binomial”. Our property is a family property who has the distinction of being transmitted by women since 1804 (since 7 generations). I just resume operations with husband Matthieu Ressiot since 2011. We are both wine experts with diverse experiences in Burgundy, Languedoc and Loire. In this course, we get a commitment to preserve the fruit above all in all wines that we sign. We hope that all these wines will allow you to experience different gourmet experiences and complementary to accompany all your good times! Ideal for red meat, lamb or farmhouse cheese.